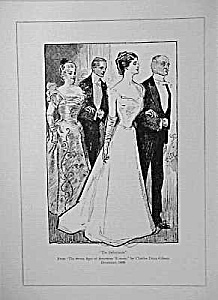 A great vintage full page original magazine page (art print) is entitled: The Debutante...From "The Seven Ages of American Woman" by Charles Dana Gibson December 1899. From a 1937 magazine. Page measures: 8 1/2" x 11 3/4". Condition: EXCELLENT. There is text on the back. Charles Dana Gibson printed signature lower left. Certificate of Authenticity is provided.